Ningura Napurrula was a young woman in her mid-twenties when she took her first journey out of the Gibson Desert in 1962 to Papunya with the Northern Territory Welfare Branch patrol. After their son received medical treatment at Papunya, Napurrula and her husband Yala Yala Gibbs Tjungurrayi were transported by another patrol back to their own country, close to the present day site of Kiwirrkura. The following year, Napurrula and Tjungurrayi walked back to Papunya with their whole family group as part of a general migration of Pintupi people from their country. Yala Yala Gibbs Tjungurrayi became one of the founders of Papunya Tula Artists in the early 1970s, and one of the exponents of the classic Tingari painting style that dominated Pintupi men's painting until the early 1990s. In the 1980s, the family moved back to the newly established Pintupi township of Walungurru (Kintore), then to Muntarti outstation in Western Australia, before returning to Walungurru. Here, Napurrula and Tjungurrayi's other two wives began assisting Tjungurrayi in infilling the backgrounds of his canvases with the meticulous, precisely placed dots that characterised the Tingari style. Napurrula first painted in her own right in 1995, in the second year of the Haasts Bluff/Kintore women's painting project. Following Tjungurrayi's death in 1998, her painting activity increased dramatically. 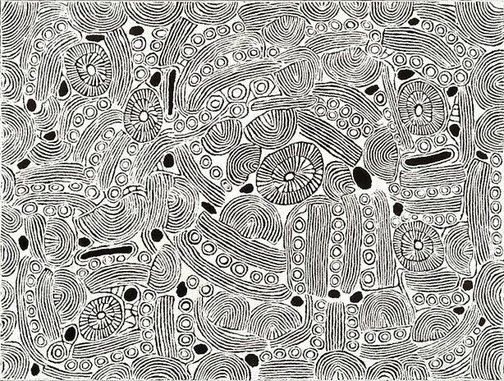 Her bold, intricate linework and dense monochrome infilling – as seen in 'Untitled (Wirrulnga)', 2000 – are reminiscent of Tjungurrayi's earliest works. Wirrulnga is an important women's rockhole site east of Kiwirrkura. Napurrula's work is strongly charged with the seriousness of women's business, echoed in the distinctive paintings of fellow Papunya Tula Artists, Makinti Napanangka and Inyuwa Nampitjinpa. Napurrula and Tjungurrayi's sons, Morris Gibson Tjapaltjarri (Mawitji) and Adam Gibbs Tjapaltjarri, now carry on their mother's and father's work in their own paintings. Vivien Johnson, Tradition today: Indigenous art in Australia , 'Ningura Napurrula', pg. 108, Sydney, 2004, 108 (illus. ), 109 (illus., detail). Ken Watson, Look , 'Western Desert diversity: Aboriginal art in distinctly different styles', pg. 7-8, Melbourne, Nov 2001, 8 (illus. ).